In the previous articles on building the cheapest PC, the premise has always been that it’d be nice to have an Intel machine, but they’re too expensive, so lets go for AMD instead. While it’s not a bad argument, the result is always going to be disappointing or underwhelming. Fortunately there is another way, and I actually put my money where my mouth is on this one. That is to buy a used PC from a site like eBay. Here we’ll talk about what to look for, how that fits into the wider scheme of building a new computer, and whether it’s worthwhile. Go to eBay and search for “PC”. Select “Buy it Now” listings – this will get rid of all the auctions which tend to leave you with commercial sellers. Filter the results to those in your country and sort by price low-to-high. In the price filter, put an upper limit on what you’re willing to spend – in this case, let’s say £175. In the filter for processor type, select “Show all” and then select the most modern Intel ix chips. Bear in mind that an i5 3rd generation will still be better than an i3 4th generation. At this point, you’ll be left with a very small number of machines, normally ex-office systems. Look through and see if anything takes your fancy. You’ll have to accept that sometimes there won’t be anything available and you’ll have to wait, or compromise on specifications. In my case, I got lucky and found this listing. 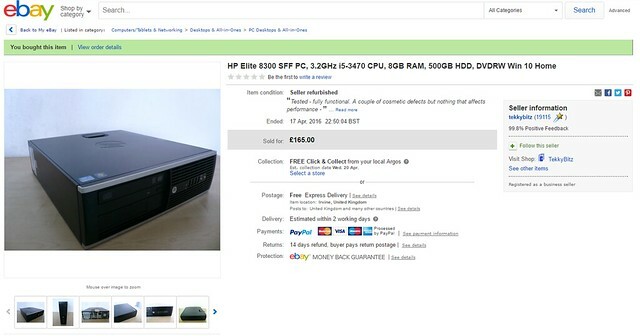 For £165 delivered next day, you get a HP desktop with an i5-3470, 8GB of DDR3 RAM, and a 500GB Hard Drive with Windows 10 installed. The last bit is important since we made no provision for a Windows licence in our previous systems, meaning you would have been stuck on Linux. When it was delivered, the first thing I noticed was that it was in an appropriate box. In this case, a HP monitor box. While the labelling doesn’t matter, it was reassuring to see that the box was a sensible size for the PC and that a good strong box was used. 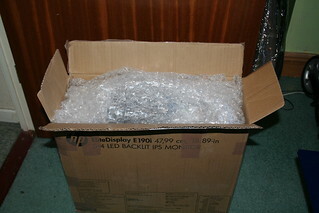 Opening the box up, you find that the machine is well bubble wrapped, and that there is a kettle lead on top. This can go to the cupboard with the eleventy million other ones I have. Removing the bubble wrap, we find an exactly as-described system. There are a few hairline scratches in the painted finish, but otherwise, there’s nothing wrong with it. The next step is to plug it in and test that all works well. Fortunately it does, so I benchmarked the system performance before we upgrade the hardware. We’ll cover this in the next section. Benchmarking done, it was time to open up the case – done using a nice heavyweight mechanical latching handle. 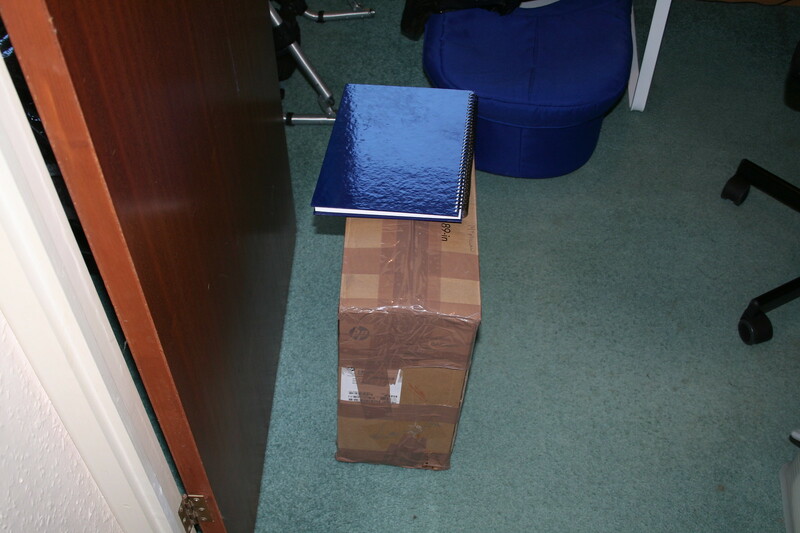 A nicely packaged system. 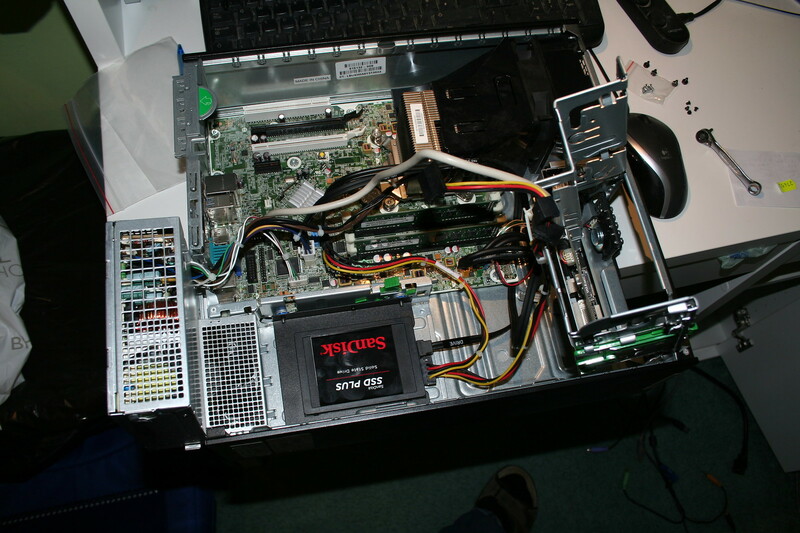 Note the non-standard power supply. It means you could not run a graphics card on this system. In a nice design touch, the front drive bays and the power supply are both hinged, giving access to the 500GB Seagate drive below. We find an internal 3.5 inch bay, and an external 3.5 and 5.25 inch bay. 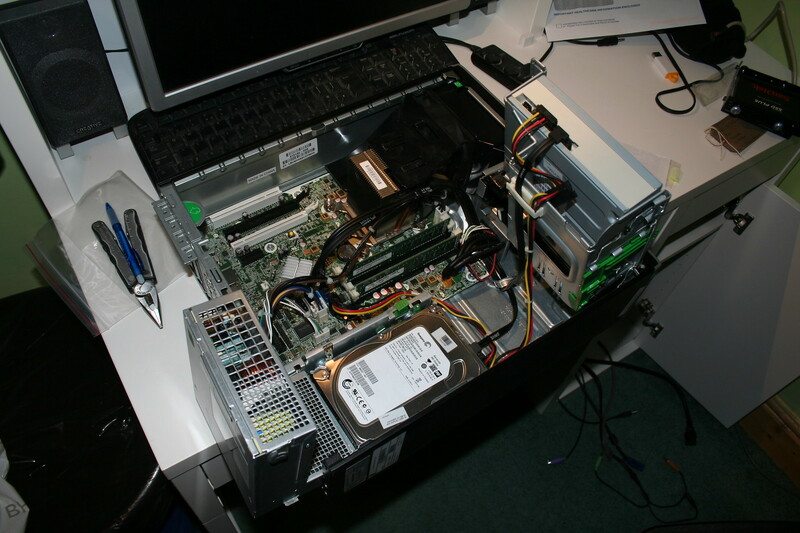 This presents a choice: The spare 3.5 inch bay could be populated either by the SSD or by the card reader from the old computer. Since my wife, who will be using this system doesn’t require a lot of storage, the card reader was chosen to occupy that slot. The Seagate drive was then swapped for the SSD. Upgrade complete. Another way to configure this would have had the SSD in the lower of the bays on the right, leaving the HDD in place. 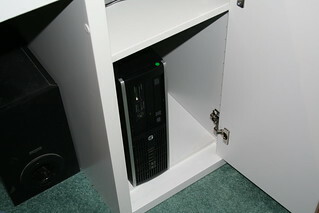 The case was closed up, the PC was installed in its new location and Windows was reinstalled. My wife now has a extremely function general purpose computer for browsing the web and doing odd tasks – The funny thing is that with an i5, it is the most powerful computer in the house, being more powerful than my Pentium K powered system. As this system was fully functional out of the box, it seemed appropriate to benchmark it using the PCMark 8 software. It scored 2621, 2421, and 3087 on the Home, Creative, and Work tests respectively. After swapping out the supplied drive for a 240GB SSD that was in the previous computer, the benchmarks were rerun. This time the scores were 2581, 2469, and 3048 respectively. In two of the tests, the machine performed worse after the SSD was installed. This would suggest that the software state of the machine is more important than having the SSD. In the real work, we know that an SSD does make significant speed improvements where file access is a regular occurrence. This does raise the question though of what upgrades are worthwhile. One way to look at upgrades is that you’re getting a much more powerful machine than you could have obtained for the some money if new. Another way of thinking is that since you have a more powerful machine, it’s worthwhile spending a little more to get the best out of the system. The reality would seem to be, that unless you have the upgrade components, or the specification is too unacceptable for the intended use of the system, then leave it alone – the benefits are not worth the cost. There’s nothing delivered for under £100, but £116 will get you an i3-3240 with 4GB of RAM, 500GB HDD and Windows 7. Moving up to £140 delivered, you can get an i5-2400 with 4GB of RAM, 250GB HDD and Windows 7. At £180 delivered, you’ll get an i5-3470, 8GB of RAM, 500GB HDD, and Windows 10. This is the same as the system I bought, suggesting I got mine at a bit of a bargain. 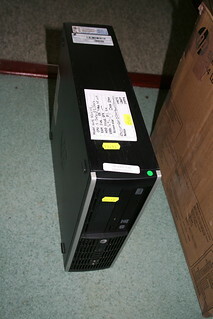 Finally, at the £250 mark, you can get an i7-3770 with 4GB of RAM, 500GB HDD and Windows 7. Because these machines tend to come out of offices, the higher end processors are going to be harder to come by, and none of these machines will really be suitable for gaming, or even conversion into gaming machines. The following graph shows their relative strengths according to CPUBenchmark.net. The first two results are for the processors recommended in the Cheapest PC articles. CPU Benchmarks (Higher is better). 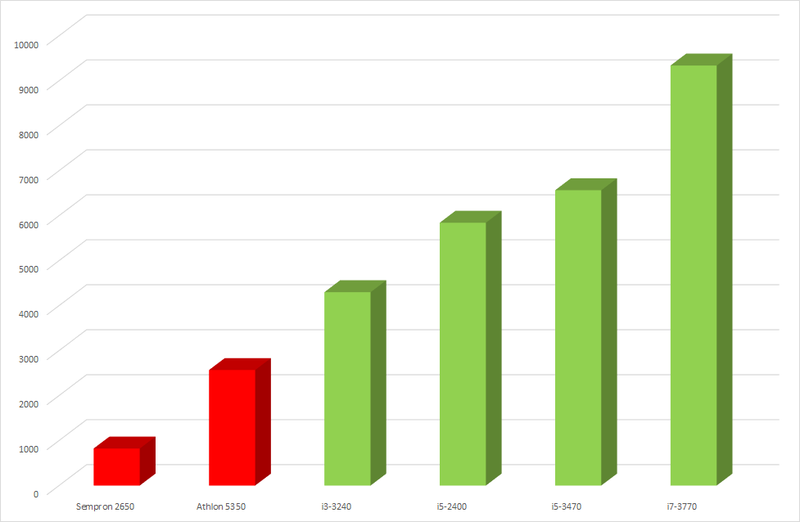 The red bars are for the processors in the Cheapest PC series. What becomes immediately obvious is just how much more powerful the Intel processors are. Even the weakest one we’re looking at is nearly twice the performance of the better Athlon 5350 chip that we look at in the Cheapest PC review. The i5 represents a sweet spot for value, while the i7 gives a worthwhile jump in performance where you have a workload that can make use of the processing power available. In contrast, the reason the Sempron 2650 only costs around the £20 mark is that its performance relative to what’s available on the market is so poor, it’s the only way you could justify selling it. By way of conclusion then. Building a brand new system is going to be the best option if you need guaranteed reliability – Remember, these machines are being sold because they’re at the end of their corporate lifecycle and are out of warranty. If you’re happy to take the risk, and most corporate sellers will give you a 30 day warranty, then it’s a great way to get a much better machine for the same money.